On several occasions in October and November of 2016, al-Qaeda terrorists fired rocket shells containing toxic gases in four civilian neighborhoods of Aleppo causing dozens of civilians to die. The attack on October 31st alone resulted in 48 deaths from chemical asphyxiation. In December of 2016, when Aleppo was in the last stage of being liberated by Syria's army, an al-Qaeda held neighborhood was being checked for IEDs. During the building-to-building search, a warehouse containing toxic chemicals and a factory where al-Qaeda made chemical rocket shells were discovered. The discovery was filmed and the chemicals documented and the information was given to the UN and to the media. Western media ignored these reports. On July 31, 2017, the U.S. Central Command issued a press release that an ISIS chemical weapons factory was discovered and destroyed in Deir Ezzor. Western media ignored the press release. On June 8th and 9th, the US-led coalition used internationally banned White Phosphorus bombs on neighborhoods in western Raqqa causing the death of 45 civilians. White Phosphorus melts the skin off of bone. Western media didn't report this event, though many civilians filmed the attacks, posted them on social media, and gave them to media outlets. On June 14th, the US coalition targeted a water crossing in Deir Ezzor, killing 43 civilians. On June 19th, twelve civilians were killed in U.S. led strikes in Hasaka. On June 27th, 42 civilians were killed in U.S. strikes in Deir Ezzor. On July 29, the US coalition targeted houses in Mayadeen, killing 20 civilians. The strikes damaged civilian homes, neighborhood infrastructure, schools, and badly damaged a hospital, disabling it. Many others died later from their injuries because the hospital was disabled. On July 31st, U.S. air strikes killed at least 60 civilians and injured more than 50 in Deir Ezzor. On August 3, the U.S. coalition shelled the National Hospital in Raqqa with White Phosphorus bombs. Deputy Director of the Syrian Red Crescent (equivalent to the Red Cross) reported: "The hospital was also shelled with more than 20 shells which targeted the electricity generators, the ambulances, and a number of departments inside the hospital.” She added that there were no terrorists inside the hospital; the hospital only provides services for civilians. ISIS has its own hospitals and private medical centers in a different area of Raqqa. After bombing the hospital, U.S. strikes continued in residential neighborhoods, killing at least 43 civilians, many of whom were children, in addition to severely injuring countless others. The hospital had been hit first, so it was disabled. There were no ambulances to come to the aid of the injured because the ambulances had been targeted. The strikes caused extensive material damage to people's homes, personal property, civilian infrastructure and schools. Omar Alasad, a Syrian Parliament member noted that the U.S. kills ordinary Syrians while shying away from ISIS, noting that "the Americans would've liberated Raqqa a long time ago if they wanted to. They know every patch of terrain in the city thanks to their satellites." On August 10th, 19 civilians were killed and countless injured in Deir Ezzor in US coalition strikes under the pretext of fighting ISIS. The strikes were conducted on residential neighborhoods. Stephane Dujarric, a UN spokesperson, said at a press conference that “an estimated 10,000 to 25,000 people remain trapped.” She expressed concern for the protection of thousands of civilians from the coalition strikes, most of them women and children. Contrary to what you are told by western media, Syria’s young men join the Armed Forces, often fighting to liberate their own cities and towns held by terrorists. This June and July, neighborhoods of Damascus were liberated after several months of fighting brigades of al-Qaeda and the Free Syrian Army (Muslim Brotherhood). The civilians who could not escape when the terrorists captured these neighborhoods in 2012-2013 have been trapped there. As the Syrian Army gains control over a neighborhood, surrounding the terrorists and forcing most to surrender, they then go building to building in highly trained urban warfare units, removing the the last remnants of diehard terrorists and rescuing the isolated pockets of civilians who remained trapped. In July, after several Damascus neighborhoods were liberated, hundreds of local residents, who had been trapped for years, stood in line for hours to sign up for the Syrian Army. Since January, the Syrian Army has liberated more than 1000 towns and large neighborhoods from ISIS, al-Qaeda and the Free Syrian Army. As in Damascus, after liberating these areas, many young men immediately joined the army to help free other neighborhoods. When the U.S. coalition strikes civilian areas, they are targeting the families of these soldiers. On June 14th, the UN chair of the Commission of Inquiry, Paulo Sergio Pinheiro, said this about U.S. strikes: "We note in particular that the intensification of airstrikes, which have paved the ground for an SDF [Kurdish] advance in Raqqa, has resulted not only in staggering loss of civilian life, but has also led to 160,000 civilians fleeing their homes and becoming displaced." Since January, and the countless liberation of towns throughout Syria by the Syrian Army, more than 600,000 displaced Syrians have returned to their homes in Aleppo, Damascus, Homs and Hama provinces. Meanwhile, just in the last several weeks, the US strikes have displaced 160,000 people in Raqqa alone. This number does not include the numbers of civilians being displaced due to US strikes in Hasaka and Deir Ezzor, of which the numbers are comparable due to the fear of White Phosphorus bombs. Al-Qaeda has used Sarin on several occasions, documented by the UN, starting in 2013. They have chemical weapons factories in Ghouta, a neighborhood of Damascus, of which the Syrian Army is conducting operations to surround and eliminate. Al-Qaeda also has chemical weapons warehouses in Idlib, where the alleged chemical attack took place in April, 2017. ISIS also has chemical weapons, as the US Command Center confirmed. This week the Syrian Army is conducting its final operations surrounding ISIS pockets in Raqqa and in Deir Ezzor. In the last stages of removing ISIS from Mosul, ISIS used chemical weapons frequently. They may do the same in Raqqa and Deir Ezzor. Who will the media blame? In April, instead of bombing the Syrian Air Force base, Washington should have instead visited that airbase, or encouraged the UN and OPCW specialists to visit the airbase. Russian expert, Igor Nikulin stated: "It would have been very easy to track Sarin at the airbase, something that would have been very difficult to hide." And why was it that no one visited the actual site of the alleged chemical attack? It was because the site of the alleged attack in Idlib is a terrorist-held area, controlled by al-Qaeda brigades, who have had chemicals since 2012. Idlib is an out-of-bounds area to anyone but terrorists, or, by people who want to live under Islamic Law (i.e. the terrorist’s families), or, by people who are being held against their will--civilians who are trapped there. The "official" gathering of evidence was done by al-Qaeda’s "White Helmets". And there’s also the fact that the terrorists did not want an on-site investigation by outsiders because unbiased investigators would have found the terrorist’s chemical weapons factory right where the alleged chemical attack took place. The U.S. hit the Syrian Air Force without any evidence of wrongdoing. And, the U.S. hit the Syrian Air Force even though it has been established that terrorist groups in Syria have Sarin and other chemical weapons. Since October 2015, the Syrian Armed Forces have liberated massive amounts of territory once held by terrorists. They have no reason to use chemicals on civilians, nor any reason to use them on terrorists. They are winning and are successfully liberating their people from terrorist-held areas. In every one of the towns liberated, within days after the Army’s engineers have cleared the area of IED’s, displaced Syrians begin returning to their homes -- more than 600,000 have returned since January. They immediately begin planting trees, rebuilding their homes and businesses, and opening schools. 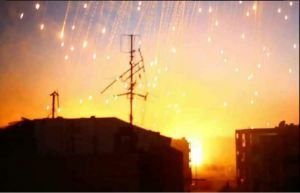 Photo: Civilians in the areas hit by U.S. strikes using White Phosphorus bombs have videotaped the attacks from their apartment windows. American and British intelligence knew since spring of 2013 that rebel units in Syria were developing chemical weapons. US Intel issued a highly classified briefing which stated that al-Nusra (al-Qaeda in Syria) maintained a Sarin production cell: the most advanced sarin plot since al-Qaida’s pre-9/11 effort. Security forces find 2kg cylinder with sarin gas after searching homes of militants from Al-Qaeda linked Al-Nusra. The gas was reportedly going to be used in a bomb. UN statement: US-led air strikes result in "Staggering Loss of Civilian Life"
Rebels fired a rocket laced with homemade Sarin into Aleppo in March, 2013. This report includes the UN reports on chemical attacks done to the Syrian Army by "rebels". Earlier this month, the Organization for the Prohibition of Chemical Weapons (OPCW) Fact-Finding Mission (FFM) presented a report claiming the mission had established the use of sarin in a chemical incident in the Syrian province of Idlib in April, but did not determine who was responsible. http://www.breitbart.com/national-security/2016/04/25/christian-assyrian-clash-kurds-syria/Christian Assyrian forces launched a counterattack against the Kurdish police Asayish in northern Syria’s Qamishli.